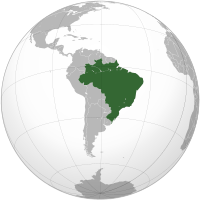 Brasil is þæt mǣste land on Sūðamerican. Manig land ymbligaþ hit norðƿeard, ƿestƿeard and sūðƿeard. Ēastƿeard is sē garsecg. Þis land hæfþ 201,000,000 lēoda. Hēr sprecþ man Portuglisc. Man nīwanost wende þisne tramet on þǣre 01:34 tīde þæs 21 Hrēþmōnaþ 2018.